Fortune favours the prepared! Book your Bountiful Bento Box for 2 for New Year’s Evening or Day. 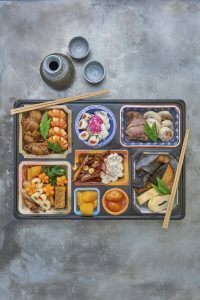 Celebrate the dawn of the New Year in Japanese style by partaking of our magnificent Osechi ryori: both delicious and auspicious, they are beautiful, bountiful bento boxes chock full of a stunning collection of especially prepared foods bursting with all the rich and flavourful promise of the year to come. Osechi are traditionally cured, pickled and prepared in the run up to the Festive Season so that come New Year’s Day, the whole family can gather together and celebrate in peace. Not only does this provide a welcome break for you but it also offers a peaceful and tranquil start to the New Year for the fire gods who preside over your kitchen. A veritable cornucopia of delicious good fortune, our Osechi feature prawns, symbolizing long life with their curved spines, appearing like the bent back of a bearded old sage. There are also scallops which are said to ease one’s path into the future, lotus root for ongoing prosperity and fertility for future generations and tamago for scholarship and wisdom among the plentiful selection of cured, roasted, pickled and poached shellfish, fish, meat, poultry, fruit and vegetables. So, honour the fire gods of your kitchen and join the Sushi and Robata family for our New Year’s celebration to eat, drink and toast a prosperous 2017 for us all.